We are at the FORCE11 annual conference taking place at McGill University in Montreal and I have the opportunity to interview Sarven after a brief presentation he has just finished, titled “Social Scholarly Web“. 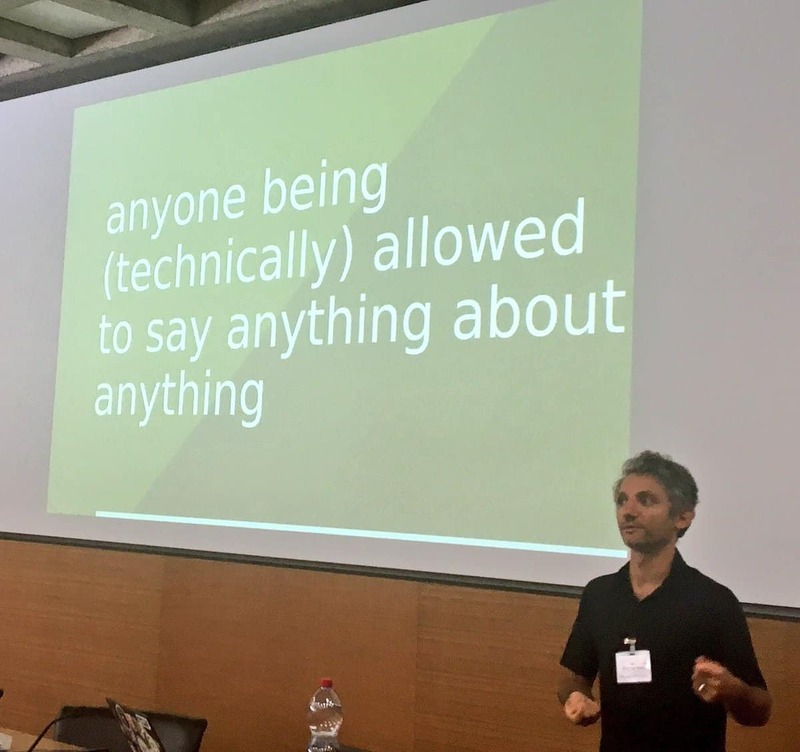 I say a brief presentation as the conference is a jam-packed few days, with three hundred and fifty guests from backgrounds across academe—librarians, technologists, and scholarly communications industry—rushing around between the three simultaneous presentation tracks. 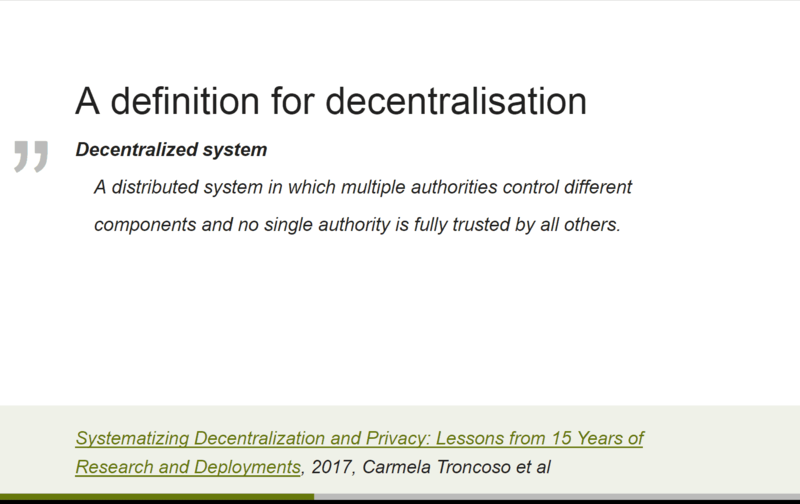 In his presentation, Sarven pointed to a definition of the Decentralized Web (DWeb) from the 2017 paper “Systematizing Decentralization and Privacy” (Troncoso et al. 2017), which synthesizes a history of the field. And among other things a series of brief demos of dokieli, the experimental publishing software Sarven has built, are hurried through, of course all are self-hosted on the open Web, the trademark of this auto-icon of the DWeb. We agree to start at the beginning of Sarven’s research journey and how dokieli came about. Sarven explains, “I was working at StatusNet back in 2008-09, in UX / UI, it’s this experience on federated social micro-blogging that gave me a foundation in Web architecture and informed my enquiry into what is currently known as ‘Social Web’.” At this time there was a push for autonomy and data portability which went under the name of federated media, this was in response to the growth of the enclosure of the information commons by social media monopolies such as Facebook and Twitter. This trend of enclosures also went against the long-standing vision of the Web as a many-to-many-media borne out of the 1960s future casting as exemplified by fellow researchers following the dictum of “show, don’t tell“ acting as public experimenters, with The Mother of All Demos (Engelbart, 1968), or the self-published book such as Computer Lib/Dream Machines (Nelson, 1974) by Ted Nelson, who coined the term hypertext. I ask Sarven about dokieli’s relationship to the Solid project. “I was welcomed to the Solid research group by Tim Berners-Lee and dokieli came about from my previous Web experiments. There was a good fit between the two projects as I was using what was being developed in Solid, its tooling, technology, and infrastructure. I was trying out advanced approaches, to figure out what’s not standardized, and to see how far we can take tooling that is purely based on open Web standards. dokieli can interact with Solid-compliant servers.” During that year, Sarven worked on Linked Data Notifications (LDN), a W3C recommendation of the Social Web Working Group, which was implemented and exemplified as part of dokieli and Solid, as well as thoroughly tested and written up as a peer-reviewed (and award-winning) academic paper “Linked Data Notifications: A Resource-Centric Communication Protocol” (Capadisli 2016) for the Extended Semantic Web Conference. dokieli and LDN also work well alongside other W3C recommendations like Web Annotation Protocol, ActivityPub, and the Linked Data Platform. The question came up of how dokieli is run, maintained, and takes user feedback. Sarven replied, “people either do or don’t buy into the principles—interoperability, using the Web layer—open source is taken as a given now; what is important for decentralization is interoperability, if we want to enable technology to serve scholarly communications.” Sarven actively solicits input from various communities, including decentralized Social Web hackers and advocates, Semantic Web enthusiasts, and Open Science practitioners. The source code on GitHub is connected to a Gitter chat, where potential users or interested parties can give feedback, ask for help, or make feature requests. Capadisli, Sarven. dokieli. Accessed 27 March 2018. https://dokie.li/. Troncoso, Carmela, Marios Isaakidis, George Danezis, and Harry Halpin. ‘Systematizing Decentralization and Privacy: Lessons from 15 Years of Research and Deployments’. ArXiv:1704.08065 [Cs], 26 April 2017. http://arxiv.org/abs/1704.08065. UCL. ‘Auto-Icon’. Bentham Project, 17 May 2018. https://www.ucl.ac.uk/bentham-project/who-was-jeremy-bentham/auto-icon. Capadisli, Sarven. ‘#FORCE2018 Presentation on Social Scholarly Web: http://Csarven.ca/Presentations/Social-Scholarly-Web/ … #LinkedResearch’. Tweet. @csarven (blog), 12 October 2018. https://twitter.com/csarven/status/1050821223565922305. Forces and functions in scientific communication, 1997, Roosendaal and Geurts ‘Forces and Functions in Scientific Communication’. Accessed 16 October 2018. http://www.physik.uni-oldenburg.de/conferences/crisp97/roosendaal.html. StatusNet. Wikipedia, Accessed 22 October 2018. https://en.wikipedia.org/wiki/StatusNet. Engelbart, Douglas. 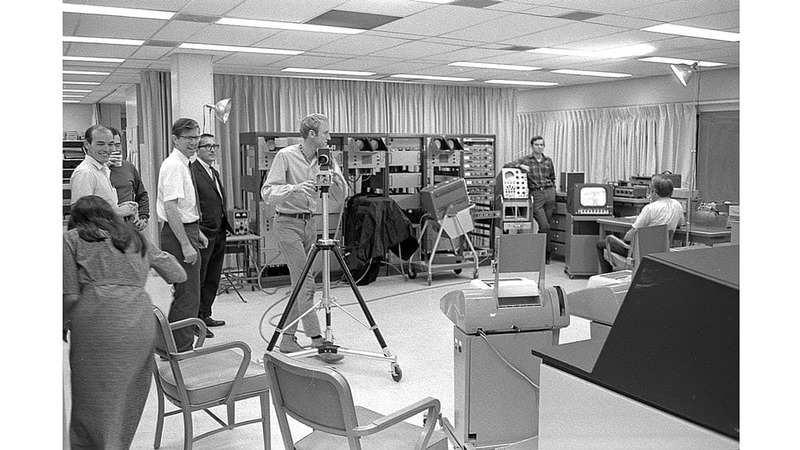 “The Mother of All Demos.” Fall Joint Computer Conference, 1968. https://www.youtube.com/watch?v=yJDv-zdhzMY. Nelson, Ted. ‘Computer Lib/Dream Machines – Wikiwand’, 1974. https://www.wikiwand.com/en/Computer_Lib/Dream_Machines. ‘Hypertext’. Accessed 22 October 2018. https://www.wikiwand.com/en/Hypertext. ‘MIT CSAIL’. Accessed 18 October 2018. https://www.csail.mit.edu/about. ‘Decentralized Information Group’. Accessed 25 October 2018. http://dig.csail.mit.edu/. Keynote Address: Tim Berners-Lee – Re-Decentralizing the Web – Some Strategic Questions, 2016. http://archive.org/details/DWebSummit2016_Keynote_Tim_Berners_Lee. ‘WebID’. Wikipedia, 14 October 2018. https://en.wikipedia.org/wiki/WebID. 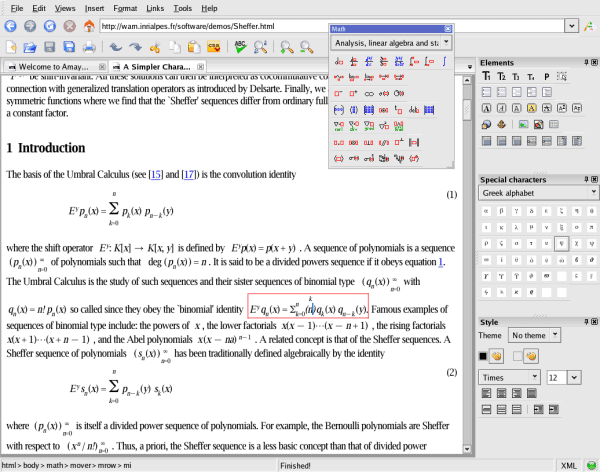 ‘Socialwg – W3C Wiki’. Accessed 25 October 2018. https://www.w3.org/Social/WG. Capadisli, Sarven, Amy Guy, Christoph Lange, Sören Auer, Andrei Sambra, and Tim Berners-Lee. ‘Linked Data Notifications: A Resource-Centric Communication Protocol’, 1 May 2016. http://csarven.ca/linked-data-notifications. ‘14th ESWC 2017’. 14th ESWC 2017. Accessed 25 October 2018. http://2017.eswc-conferences.org/. ‘Web Annotation Protocol’. Accessed 25 October 2018. https://www.w3.org/TR/annotation-protocol/. ‘ActivityPub’ Accessed 25 October 2018. https://www.w3.org/TR/activitypub/ . ‘Linked Data Platform 1.0’. Accessed 25 October 2018. https://www.w3.org/TR/ldp/. 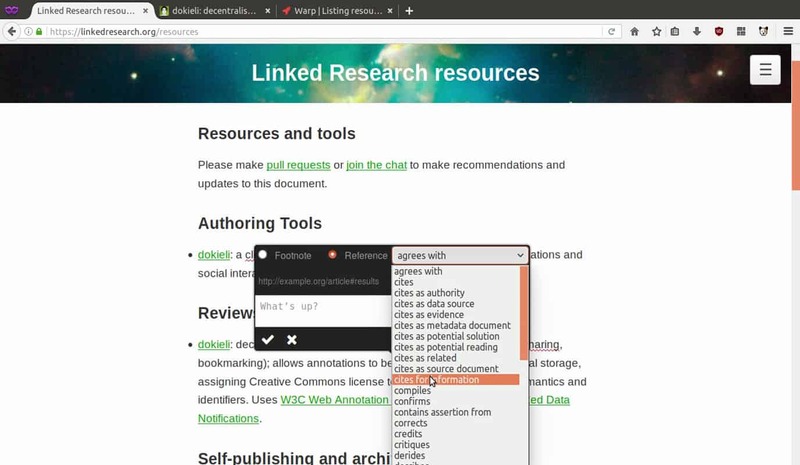 dokieli Is a Clientside Editor for Decentralized Article Publishing, Annotations and Social Interactions: Linkeddata/Dokieli. https://github.com/linkeddata/dokieli. Herbert @hvdsomp@octodon.social. ‘Very Much Agreed. Couldn’t Care Less Whether Infrastructure Is Operated Using Open Source, Commercial, Whatever Software. It’s about Whether the Infrastructure Components Provide Open, Interoperable, Web-Centric Interfaces.Https://Twitter.Com/Csarven/Status/1050487942265884672 …’. Tweet. @hvdsomp (blog), 11 October 2018. https://twitter.com/hvdsomp/status/1050491565552984064. Next: Next post: What Can Open Science Learn and Use From DECODE’s Blockchain Urbanism Research and Tech Stack?